Inspired by Alexander Hamilton's legacy of leadership through service, Alexander Hamilton Scholars (AHS) empowers high-achieving, underserved students to succeed in college and career. In 2004, George Cox recognized the economic and opportunity gap between high-achieving, low-income students and their higher income peers. He believed that the debt burden of graduating college, coupled with a mismatch between student aspirations and appropriate postsecondary courses of study, created significant barriers for low-income students. Yet our founder firmly believed that, given the right tools and guidance, these high-achieving, low-income students could begin breaking the cycle of poverty for their generation and take their places as future leaders of the nation. For inspiration, George looked to one of our nation’s founding fathers. 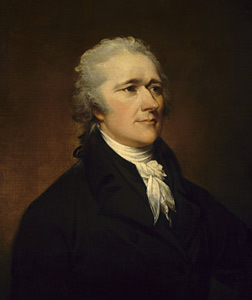 Of the founding fathers, Alexander Hamilton was the only one born into poverty. As a result of mentorship, guidance, and a scholarship to attend college, Hamilton was able to leave a lasting legacy that forever changed our nation. George hoped to provide today’s brightest low-income students with the same opportunities Hamilton received, so they too can become innovative leaders of our nation and our world. With his West Point classmate, Bill Thomas, George created Alexander Hamilton Scholars in an effort to close the opportunity gap for America’s low-income youth.